Red Speed, 2008, car, cardboard, paint, silver foil paper, adhesive tape, marker pen, stickers, plastic, four plastic shields mounted on MDF board, sixteen trophies (metal, glass, marble, MDF, wood), and calculator, 4' 7“ x 8' 8 3/8” x 17' 6 5/8". Installation view. Thomas Hirschhorn’s current exhibition, “Poor Tuning,” presents ten pimped-out race cars parked, as though after a contest, in two symmetric rows angled toward each other. Multicolored bunting crisscrosses the ceiling and runs out through the space’s open garage door, creating a celebratory and welcoming carnivalesque air. Bought locally and used, the cars have been retrofitted, in Hirschhorn’s signature fashion, with cheap materials and recyclables. Like the DIY work of a die-hard car enthusiast on a tight budget, the makeshift race cars are hyperbolically and lovingly tricked out. Covered with stickers and exclamatory phrases written in marker and tape, customized with baroque wings and exaggerated grills, reupholstered in foil or tape, augmented with rocket engines under or over open hoods, outfitted with menacing tire-shredding hubcaps, and buttressed with interior structures of paper tubing, the cars look prepared for stunts worthy of Quentin Tarantino’s Death Proof (2007). We witness the cult of spectacular customization. Each fetishized machine has been theatrically named, forming something like a typology of the hot rod: Death Car, Mexican Touch, Techno Champ, Pro Type, Ghost Catcher, Real Trasher, Natural Performer, Yellow Power, Red Speed, and Black Exhaust (all 2008). As opposed to Hirschhorn’s relatively uninspired concurrent installation at the nearby Museo Tamayo Arte Contemporaneo, “Poor Tuning” invites reflection related to the locality of its site, both in the openness of the gallery’s warehouse space, evocative of an auto mechanic’s garage, and in its proximity to Mexico City’s Colonia Hipodromo-Condesa neighborhood, a now-desirable destination urbanized at the turn of the past century around what used to be a large horse-racing track, the Hipódromo. An ad hoc “dromology” (a term issuing from the Greek word dromos that Paul Virilio has used to signify the science of racing and speed) drives “Poor Tuning.” Absurdity of form paired with exaggeratedly decorative sloganeering satirizes the capitalistic obsession with speed and high performance, which perpetually escalates in tandem with our ever-advancing techno-centrism. But with accelerated speed come high-impact crashes, fatal collisions, and broken bones. Hirschhorn develops an art of the anticipated accident, acknowledging catastrophe as the hidden face of technological advancement. 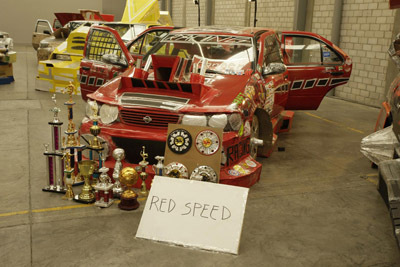 Accordingly, death colors the winning car bloody: Red Speed is symbolically awarded an array of soccer trophies and an ominously oversize calculator at the foot of its front bumper.